... bottomless iced lemon tea. ... a rather costly Parmesan-Crusted Chicken Quesadillas as appetizer. ... close up on Parmesan-Crusted Chicken Quesadillas. ... it falls off from the bone easily. Nicely done. ... close up on the beef ribs meat. ... the Brownie Obsession was something new. Decided to give it a scoop. PG was enjoying the view of The Curve Boulevard yesterday when we were at Italiannies. He wanted to experience the same thing again today, hence we went next door of Italiannies, the brother company, TGI Friday’s. PG ordered the ribs while I picked the appetizer. The appetizer was quite good, though the price was not cheap. While the ribs was interesting, but it was a bit charred/dried. Anyway, I’ve never had beef ribs for eons, I guess once a while makes no harm to my strict diet. The dessert was very sweet though. I thought I could substitute Chili’s molten chocolate cake with this brownies, but I guess I was wrong. Both of use could barely finish it. ... found this shop on the net before I came for dinner. ... 3 items, cost me HKD51. ... Coke with lemon slices, as recommended by ALGJ. ... I've got no idea why I went for the peanut butter toast instead of the polo bun. 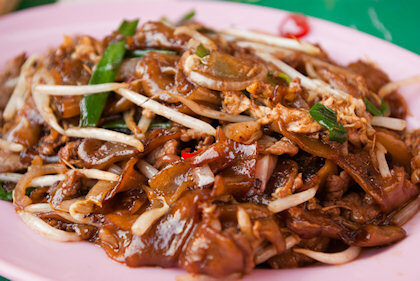 ... HK is famous for its 干炒牛河 (stir fried flat noodle). See if it's as good as the one I usually have. ... this soup was complimentary. ... the soup was excellent despite being free. The best item during my meal. Ditch the rest! I found this shop online while pondering what to have for dinner. It was just nearby where I stay hence I decided to just walk over. It was about 500 metres away from my hostel. Unfortunately, the menu was in Chinese, and only Chinese. I was having hard time identifying the items. Fortunately, my shallow knowledge still manages to identify the fried flat noodle. Fried flat noodle was like a superstar in HK dramas and movies, because it’s a common food for the locals here. Hence I always have the impression that it must be very nice, definitely nicer than my country’s local version of fried flat noodle. When it was served, the aroma was really good. Despite the lacked of taste (healthier HK lifestyle perhaps? ), it was still considered good. Though I preferred the one from DoReMi more, which is far more sweeter and saltier. The aroma was comparable too. The toast was nothing to shout about. As for the Coke with lemon, which was highly recommended by ALGJ, it was seriously no difference from those I get in Malaysia. Big boohoo to ALGJ for bluffing. Despite the mediocre food, fortunate enough the soup was superb. It’s the best stuff served to me on this very evening. The best part was, it’s FREE! The taste was just right, mildly sweetened too. Seeing that most food seems healthier in HK, I believe the flavours from the soup was genuinely boiled from the meat, instead of the magic of Ajinomoto. 4 thumbs up for the soup. If only I have the 5th thumb. ... BBQ Bacon Burger which wasn't available in Malaysia. Unfortunately, the bacon was beef, not pork. Which made this place a halal fast-food restaurant. ... the inside of the burger, which has overflown BBQ sauce. Only 3 thin strips of bacon given. After our trip to Lantau Island, we went on straight to hill top via tram. There we visited Madame Tussauds’ wax museum. After that, we went to BK for dinner. Seeing that it’s in HK, we were so sure that the menu would be different from ours. The only thing was, we were all hoping there was at least 1 pork item on the menu. Unfortunately, it turns out to be pork free. Anyway, I had the BBQ Bacon Burger, to deceived myself that I was actually having pork bacon. The BBQ sauce were too much, while the bacon were only few strips. I could barely taste the bacon in it. The meat patty tasted pretty much the same as usual BK’s burger. I order just an ala carte burger and it wasn’t cheap. ... while waiting for food to be served. These classic China you won't see at the food court outlets. ... Qing Hai style noodle with chicken. ... stir fried mutton, which was quite spicy. ... Xin Jiang style noodle, which seemed more appetizing than the one I had last time @ Carrefour. Finally, today I managed to try the more “genuine” Xin Jiang style noodle. As opposed to the one I had in Carrefour, which turns out to be overly soupy. The gravy in this Xin Jiang style noodle was more toward sourish, nothing like padprik at all. I like this one better as the noodle was better too, not oily feel as I had from Carrefour outlet. The stir fried mutton was quite disappointing. Aside from not tasting like mutton, it was damn sinewy as well. After a few chew, it tasted like there was bloody stink in it. I don’t like it. As for the Qing Hai style noodle, the gravy used was different, though the colour was quite similar.